Two new Deletor support cards that power up. AUTO When this card is placed on (RC), if your opponent’s vanguard is deleted, this unit gets Power+2000 for each of your other units with “Deletor” in their card names until the end of the turn. 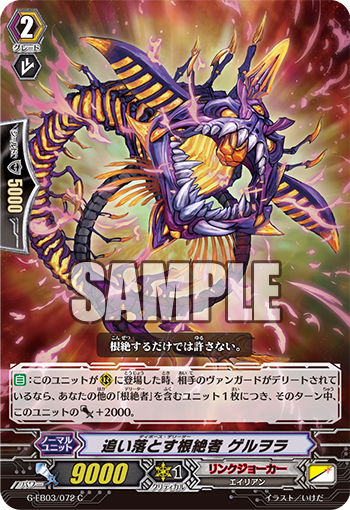 ACT [Counter Blast 1, put this unit into soul, and retire one other “Deletor” rear guard] Choose 2 of your units and they get Power+3000 until the end of the turn and if your opponent’s vanguard is deleted, draw a card.